China’s hip hop dance survival show Hot Blood Dance Crew <热血街舞团> owned viewership charts when it finally premiered on iQIYI last Saturday. 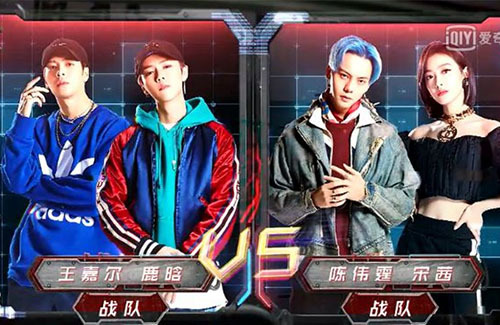 In the reality show, which stars Lu Han (鹿晗), William Chan (陳偉霆), Jackson Wang (王嘉爾), and Victoria Song (宋茜) as team leaders, various dancing teams have to compete against each other to become the top dance crew of the nation. The four team leaders opened the show by performing their own solo dances alongside their own dance instructors. Lu Han’s solo performance was choreographed by Rie Hata, who Lu Han said had created one of the hardest dances he’s ever had to do. After all team leaders completed their solo, the 191 contestants submitted their votes on who’s team they wanted to join. William joked at the time that he wanted to be in fourth place so he could show viewers more improved sides of themselves. After realizing that he did lose to Lu Han and Jackson’s team, the actor turned around with an embarrassing smile and slapped a hand over his face. HBDC broke 100 million viewers 40 minutes after the first episode went on air. Scoring high ratings and trending on social media, the show is being pitted against Street Dance of China <这！就是街舞>, a similar hip hop dance show produced by Youku. The appearance of well-known and coveted street dancers in HBDC is attracting much more viewers to tune into the survival show. Some of the competitors that have appeared in the first episode include popping master Feng Zheng (冯正), hellodance’s Huang Xiao (黄潇), and world-winning locking master Xiao Jie (肖杰), KOD’s world championship for four years in a row. He was also the first Chinese dancer to win the championship in Japan. Don’t know how good Lu Han meant to be at dancing, but through the clip, she’s outdance him by miles. She has more swag, more character, and she get down low. Lu Han while he does do a decent job, he did not go low enough, lacking the swag, the pop and lack in character. I don’t get the appeal of Lu Han, his beauty just meh to me. Victoria’s dance concept is cute, and there is good bits about them, however there are too many poses, and in general very soft. William’s dance is a hot mess >_< trying to be cool and showing off does not mean good dancing. They need to get the choreography right first, you will look cool if the choreography is decent and dance well. Jackson is best dancer out of them all. He goes low, he has swag, his dance was fun, he shows a lot of character. However, his dance is not as complex as Lu Han. So Lu Han’s dance is still the best so far, he was luck to have her choreograph and dance with him. For a coach, I would pick Jackson lol. “I don’t get the appeal of Lu Han, his beauty just meh to me”… oh yes, I totally agree with you on this one. I heard so much about him so I searched him up and showed my sister his picture on screen and she was like “hey, this GIRL looks like young Anita Yuen (Chilam’s wife) but not in the good way”…OK, I rest my case. As for William’s dance number, I really love it indeed. It was contemporary dance with “puppet dance” theme. It was soft and passionate at first then powerful but still provocative later on. Contemporary dance is a story telling dance. If you get it then it’s a hit, if not then it’s just meh. This kind of dance is quite popular in US, but not other part of world yet… Therefore, I really applause William for taking this risk. Also, I’m very into contemporary dance so I’m bias. Btw, Galen Hooks is a very talented and well known choreographer in Hollywood. @olivegarden haha that’s funny, love your sister comment xD So Victoria’s and William’s are both puppet theme? Rewatch it again, seems somehow I miss a bit of the beginning part, however, the choreography is a bit everywhere. There are parts that show they control the other person’s actions like a puppet, however, they then break out and do break dance, and dance individually rather than together. There is a disjoint and disconnect, I just don’t feel it. I can get she follows the theme I was a puppet then I become a puppeteer, however it just felt messy. And William’s stiff shoulder and hands just made it even more uncomfortable to watch? While not understanding the theme might impact your judgement on the dance piece, there are other factors apart from the story telling, like the chemistry the partner, how well it is danced and how well it’s acted, whether it draws you in as it progresses, etc. just based on my first watch I would rank it last, that’s all 🙂 I can’t say I remember what the theme of jackson’s Dance is, however, he has the most charisma while dancing, and it shines through. He was the only one out of the 4 that my eyes glue to him instead of his partner, whereas it’s 50/50 for Victoria and her partner and the girl for Lu Han, and my eyes was on William for a wrong reason to cringe lol. I can’t say I’m into that much dance stuff, I only watch SYTYCD 🙂 and I don’t know Galen Hooks, and the thing about choreography is she also needs to cater to his ability? So while she might be talented, she might have to dump it down a lot? Unlike the girl who is with Lu Han, who tried to push it. @littlefish haha I was amused by her comment as well. I’m quite impressed with your detail observation on the technical skills of the dancers. My judgement is just simply based on how I feel to the vibe, the art and the capability to deliver the message from the dancers that touches my inner feeling. It is hard to explain but let’s just agree on our differences. I’ve watched pretty much all the Hollywood dance shows like SYTYCD, DWTS, America’s Best Dance Crew (2008 – 2012) one of the best dance shows ever. I can see the similar concepts in many Asian Dance shows nowadays. It looks like Hollywood has been there and done that.